Persephone a.k.a. Kore is the daughter of Zeus & Demeter; the harvest Goddess. She was abducted by Hades, King of the underworld & must remain down their as his wife for half her life. Her mother, Demeter, misses her terribly & goes into mourning & hence we on Earth experience Winters. 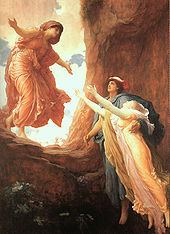 Persephone's abduction represents her function as the personification of vegetation which shoots forth in spring & withdraws back into the earth after the harvest. In classical Greek art, she is robed & carrying a sheaf of grain. In Latin literature she is Prosperina.